As a school kid, I participated many times in Republic day parade and functions on 26th January. When not in school, I watched republic day parade on TV to see different contingent of armed forces and diversity of India. Pride with which our armed forces march is infectious. The armed forces are defenders of our republic and republic day is celebrated as day of adopting our constitution and in honor of our armed forces. Various state processions that we see just give a glimpse of diversity and complexity of our nation. Those who understand it understand the value of Republic Day. Those who follow AAP politics closely will know what I am going to say next. I can’t respect any Indian who disrespects this festival of democracy and when I heard Kejriwal saying that republic day is nothing but procession for VIP and threatened to fill Rajpath with his AAP supporters [See Report], I was shocked beyond words and wondered if any self-respecting Indian can ever say such thing. I have been a critique of Kejriwal or former Anna movement people starting a new political party because I knew that this move will only help Congress. I, like many other Indians, have an opinion that Congress and its style of politics is root cause of all evils in India and unless you have Congress completely removed from India, we won’t be able to make very significant difference in India. Therefore whosoever ends up giving and taking support of Congress politically ultimately ends up helping its survival. I must remind you that Congress of 1940s is very different than Congress which is now a proprietary of a family and its sycophants. Many will remember that IAC movement was started in backdrop of rampant corruption scandals of Congress by likes of Sri Sri Ravishankar and later joined by Annaji, Arvind Kejriwal. Before even IAC was born people like Baba Ramdev and RSS affiliate organizations were raising awareness about corruption of Congress government. I was also trying to do my best to spread awareness through whatever public forum and social media tools access I had. I was thrilled by IAC movement and supported it, and was on Ramleela grounds when Annaji broke fast on 27th August 2011. Events which happened after August 2011 dismayed me as I saw people like Kejriwal trying to use Annaji as a mascot. I liked activist Kejriwal and like many, promoted his pictures of sleeping at train station via available channels. Later on news reports started coming that Kejriwal is about to ditch IAC movement for politics, under influence of former Congress strategist and Rahul Gandhi adviser like Yogendra Yadav, Sonia’s NAC member and Arvind’s guru Aruna Roy, known Narendra Modi hater Ashutosh Gupta (Former IBN7 editor and Now AAP LS candidate) and Prashant Bhushan. I started doubting Kejriwal’s intent and reason behind his desire to form a political party. A well informed activist like Arvind Kejriwal already knows what the root cause of India’s problem is, but when instead of removing that root cause, he starts helping in its survival by attacking the people who can definitely finish Congress, than it’s obvious his intents are not pure. As I said earlier I liked activist Kejriwal, but after seeing his range of activities (mostly orchestrated for eyeballs) after he formed political party, I don’t like politician Kejriwal. There are various reasons, over a period of time, which strengthened my doubt that Kejriwal and current top leadership of AAP is carrying out Sonia Gandhi’s agenda (even if unknowingly). There was a great hope in some when AAP won 28 seats in Delhi Assembly elections and got a chance to form government as it provided Arvind Kejriwal a chance to walk the talk. It’s very rare you get what you wish for in politics so soon. City state of Delhi, with less rural population provided a great platform to practice his absurd communist inspired theories – but it was worthy to see and give him a chance, may be they could have worked. May be. fooling Autowallahs and temporary workers by promising the moon, and not delivering the mustard seeds. He also claimed that his corruption helpline has received more than 1 lakh calls but here is loophole, out of those calls only 1200 were considered prosecutable, out of these prosecutable calls conviction will happen in less than 50 cases, so what Kejriwal has achieved by having this helpline? No one in AAP now takes name of Mohalla Sabha based ticket distribution of Loksabha candidates and winnability or connection with Kejriwal has become only criteria. Kejriwal’s tenure of 49 days was full of contradictions between walk and talk. In-fact walk and talk contradictions started when after saying it openly that he won’t ever join politics to taking Congress support in forming his government, but I would have forgiven him for that, had his govt really fulfilled those promises. Instead he chose to walk-away giving some cooked up theory about how Congress and BJP are evil in that – only the blind supporters of his party could buy that. Inspite of all goof ups and U-Turns which Kejriwal has made as politician so far, lots of his supporters still believe that his intentions can’t be a suspect. But as a keen watcher of Congress style politics and seeing Kejriwal following the same, I have great doubts on intentions of Kejriwal and current AAP Leadership. I can’t help it. 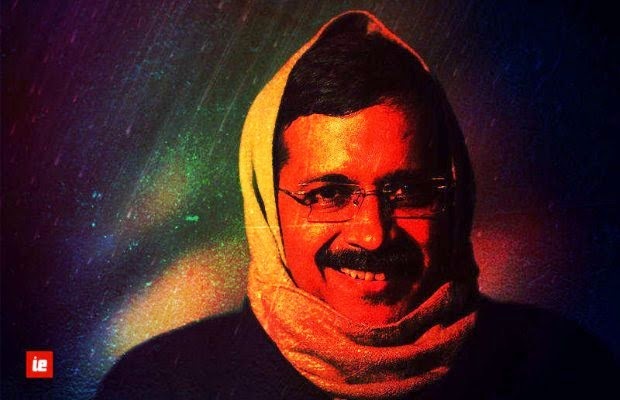 It’s a known fact that Kejriwal and Sisodia have receiving funds from Ford Foundation and foreign agencies for their NGOs in the past – some may call it conspiracy theories – but I can’t help but engage the idea that what if it is true? What if the whole channeling the dissat of the Indians against Congress policy into furthering America’s influence in India is true? This doubts won’t go until I see Kejriwal produces something concrete in results – till now, it’s just a lot of talk, talk, talk. Prashant Bhushan somehow feels that giving referendum rights to Kashmiri separatists and tribal in Maoist areas is a brilliant idea – though his brilliance has been silenced by Kejriwal these days, but I’m sure it is temporary. With anti-dam activist like Medha Patkar and anti-nuclear power activist Udaykumar as prominent candidates how exactly AAP wants to make energy hungry India as energy surplus state? AAP is inviting known convicted Maoist murderers like Soni Sori and Sabyasachi Panda (he killed 80 years old sanyasi Lakshmananand Saraswati) in AAP, I fail to understand how will it strengthen India. AAP thinks that all capitalists, except Jindals, Munjals and Bajajs, are bad and never say a single word against coal scam tainted Jindals. Suddenly on the eve of one of the most important general election we are hearing from so called great anti-corruption activist, as politician saying that ‘Communalism’ is bigger threat than corruption. Kejriwal also raised flag that Batla House encounter as fake and wrote to free khalistani terrorist from jail. Recently lots of people who were involved as founding members in AAP such as Madhu Bhaduri (Former Indian Ambassador to Portugal) and Ashwini Upadhyay (head-legal cell), have raised so many questions on functioning of AAP and Kejriwal. Kejriwal, who has questions for everybody like a quiz master, doesn’t even respond to his own colleague’s queries. I have also tried asking many questions to AAP leadership via social media but none of them responded. People who are getting ticket for Lok Sabha in AAP without doing any work in past for AAP has created a lot of issues related to failing of internal democracy in AAP. Just an example of his double speak can be how he has given ticket to Yuvdhir Khyaliya [read TOI report], who replaced Ashok Khemka and gave clean chit to Robert Vadra in DLF scam while Kejriwal himself never gets tired of taking credit of exposing Vadra scam! Kejriwal and his Aam Aadmi Party looks like more and more smaller version of Congress, which tried to rule via pseudo secularism, lies and fooling people. Congress never removed Garibi, their core-agenda; AAP will never remove corruption, for the same reason. The only difference which I am able to see between Congress and AAP is Congress fooled poor and illiterate while AAP and Kejriwal are able to fool educated people. I would have still given AAP a chance if they first proved themselves in governing city state like Delhi and than thought of big national ambition. But it felt like AAP under Kejriwal and Yadav is more interested in running Sonia Gandhi’s agenda of cutting anti-Congress, pro-BJP votes in urban pockets than doing any good for common public. AAP supporters may give any logic – but mathematics stand, eventually, this Kejriwal0magicis taking us away from a stable government in India. AAP supporters should ask countries like Ukraine, Libya, Syria – how stability is important and not secondary. AAP and its leadership seem to be more interested in hogging TV time by making outrageous allegations and doing one drama after other. Kejriwal and AAP are adding nothing but nuisance value in otherwise an election which might be giving India a stable decisive government. I hear lots of people as saying that Kejriwal is behaving like a Mohalla aunty, whose fame is based on gossip mongering and finding fault about all people and their families in Mohalla while saying that her kids are greatest of all. Funny, but I can’t seem to disagree, I am slowly getting tired of one-stunt-a-day politics. Instead, I personally am open to betting on a proven horse who has performed in the past – even if not perfectly – but is the best leader available. I refuse to fall for the nonsensical dreams of Kejriwal platoon – whose views change everyday like daily temperature. This is not the becoming of a national leader, but simply somebody who’d say anything that sells. What gives backing to my doubts on Kejriwal is that AAP’s agenda has suddenly changed from anti-corruption to anti Narendra Modi. If you heard any of Kejriwal’s recent speeches 99% of its content is about Narendra Modi being a demon who will destroy India if he ever comes to power. He recently went to Gujarat on study tour to check development in Gujarat. It’s so funny that a person who was earlier issuing honesty certificates will now start issuing development certificate too and have diversified his certification portfolio. All this without a single concrete work in produced in his short legacy of 49 days. He could be a good IRS agent – but Arvind still has to learn a lot about governance, only if he’s interested in learning. I have lived in Gujarat since 2003 and own property in one of the best Gujarat cities so I have seen what kind of development Narendra Modi has done in Gujarat. but Kejriwal is behaving like gutter inspector or in fact like a foreign tourist, who if he wants, will find filth in New York, London, Paris and click pictures to show how backward these places still are! I’m not saying Gujarat is New York, but was Rome built in one day? People who live and work in the real world understand that no solutions are ever perfect and governance is a continuous process. Readers are mature enough to make their decision on what Narendra Modi has done. When Kejriwal says he wants to show people truth of Gujarat by telling lies than it pains me to see how low he has fallen. He could have shown how different India would be under him by ruling Delhi but he decided to run away in pretext of not passing Jan Lokpal while Orissa assembly passed Lokayukt bill at same time without any fuss. If he did something good I would have been interested in listening to his criticism of Narendra Modi, who has been developing Gujarat on positive agenda while Kejriwal only talks negative about everything under the sun. I have problem with Kejriwal telling contradictory lies with innocent face and it doesn’t inspire confidence in me regarding his intentions. I doubt Kejriwal’s intentions as he is more interested in doing drama by sleeping on road, having more anti nationals and fringe elements in AAP, destabilizing India by fractured mandate and hog more TV time by hook or crook. At a time when India needs stable government under able leadership, Kejriwal’s agenda seems to be keeping Congress relevant by cutting anti-Congress votes. Kejriwal made impossible promises with impossible deadlines and couldn’t deliver in-spite of having a good chance. His real intention feels to be of a spoiler who can be helpful to Congress by creating fractured mandate but Indian democracy at this stage needs an experience person with proven track record. In my view India doesn’t need Kejriwal type self-confessed anarchist in 2014 election who is just adding nuisance value. Kejriwal please think about my suggestion seriously and spare my country of your drama. I always remember one Sanskrit proverb “अतिविनयम धूर्त लक्षणम्-Extra Humility is Sign of a Thug” but never fully understood its meaning till I saw Kejriwal and Yogendra Yadav speaking on various issues. Just watch them how easily Kejriwal’s travels in charted plane and calls it necessity and welfare of Aam Admi. Just hear how easily he and AAP switch from “में तो छोटा आदमी हूँ मेरी क्या औकात है” to Kejriwal is Ex-CM and everyone should give him that respect and privilege. What sickens me is that AAP supporters will justify every act of Kejriwal and project him like a saint. Why so deluded? He is no saint, and quicker Indians realise this the better it’ll be for India. He is an extremely shrewd politician, who unfortunately is taking his supporters for a ride. Sadly, there’s nothing at the end of that ride, but only a shining political career for Kejriwal and his close-aides. A common Indian, who would like to see India as developed nation soon.